We're taking a break from the Nine to Five series for the month of August, but we'll be back after Labor Day with some lovely bloggers who have some serious style. 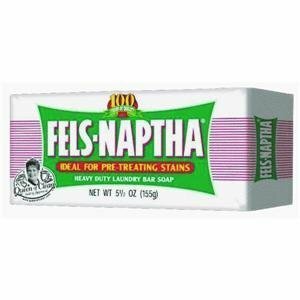 So today, I'm going to share with you a product that I absolutely love and swear by when it comes to stain removal: Fels-Naptha bar soap. This stuff is magic. From furniture fabric to clothing, from grease to makeup stains, it gets everything out. My sister uses it at her house to get crayon masterpieces off of her couch. I use it when I spill ketchup on myself. OR when I buy a blouse for super cheap because it has makeup on it. That peplum top I got from Banana Republic? I got it for wicked cheap because I noticed a bunch of foundation stains around the collar and brought it up to the sales associates. Then I went home and scrubbed it with this bar of soap, and it came out like new. And for $4, it lasts forever. I highly recommend adding it to your cleaning repertoire. is it all natural? because if it is...i need it. That is TOO perfect for me right now!! Thank you lady! I have a bunch of makeup stains (how they even got there, I don't know) on my white walls.